A few years ago, quite a sensation was excited in the horticultural world by the introduction of the above peafeh. The interest did not attach to the fruit so much as to the tree as on account of its dwarf habit, it was said that it could be easily protected from the severity of the winter. We believe that it amounted to but little, practically, and that no one made a fortune by raising fruit of that variety. We have just tested a specimen - the first we ever saw, and find it quite a large, oblong peach, shaped and pointed like the Crawford's Early; of a dull yellowish color; flesh deep yellow; rather insipid; ripe the middle of October. It is a cling, and would be hardly tolerable, if ripening earlier in the season when good peaches abound. - American Rural Home. From what I have seen, and what I have heard of this pear from observing men, I fear that those who have built high hopes upon it, from the triumphant tones with which it entered the United States, will be disappointed. It bore with me last year, on a thrifty young tree, from grafts which I obtained of Mr. Charles Downing, and which, I have no doubt, are genuine. The fruit cracked and spotted before it was half matured, which caused it to grow out of shape; and the flavor, when I gathered and ripened it, amounted to nothing. I have also seen it at the exhibitions. I shall not propagate it. Tree - vigorous, and an abundant bearer, suitable for a pyramid, and succeeds on the Pear and Quince stocks equally well. On account of the size of the fruit, we have thought the tree worthy of trial against a wall. The size of the fruit is enormous, seven inches in length, and twelve inches in circumference, calebasse shaped. Skin - bronze colored, brighter where exposed to the sun. Stalk - very short, thick, fleshy, but sometimes it is long and slender; it is inserted in a small, narrow cavity. Eye - open, in a wide spreading hollow, surrounded with small plaits. Flesh - white, coarse, fibrous, breaking, with but little juice, sweet and perfumed. Season - October. This superb fruit was obtained by Van Mons, in 1820, and was named by him in compliment to the eminent Dutch dfemist, Van MaRum. Size - full medium. Form - obovate, obtuse-pyriform. Stem 1 - rather stout, one inch in length. or more. planted in slight cavitv. Calyx - closed, rather deeply sunk. Skin - pale yellow at maturity, with a few russet traces, and occasionally a red cheek. Flesh - melting, juicy, and tender. Flavor - pleasant, subacid, and rich. Season - October to November. Quality - "very good," if not "best." Tree - a healthy, good grower; much of the habit of the Urbaniete, which it resembles, both in foliage and fruit, but is clearly a distinct sort. TAN MOMs 1826. 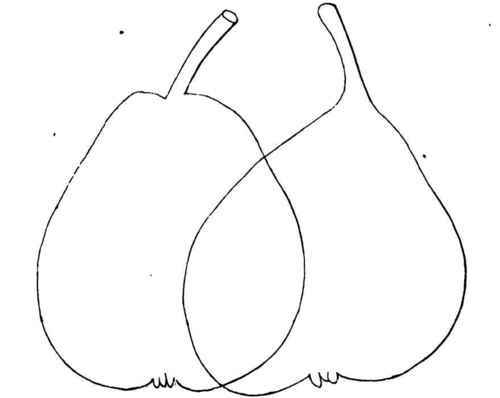 POIRE d'aVRIL.